Provide information and directions to the public; investigate and resolve visitor complaints; ensure public safety, protection of natural resources, and the enjoyment of parks and open space areas. Explain and/or enforce applicable rules and regulations to park visitors for the purpose of protecting and preserving natural, historic, and cultural features, sites, and structures. Effectively patrol front and back country areas by foot, vehicle, boat, horse, and mountain bike as needed. Issue warnings and citations to violators; conduct investigations of reported offenses/incidents to collect evidence, statements, and other relevant information as needed; may be required to provide testimony in court regarding investigations and/or citations. Prepare and maintain records and reports. Keep daily records of observations, activities, incidents, public contacts, unusual wildlife and plant sightings, resource damage, safety hazards, etc. Sell and issue permits as required and account for collected monies and/or collect and handle donations from donation vaults. Perform maintenance and repairs to amenities such as fences, gates, signs, trails, restrooms (including occasional cleaning), and other structures as required. Participate in interpretive educational and public outreach programs as needed. Principles and practices of effective natural resource management, ranger services and implementation of natural resources management. Area ecosystems and related native plants and wildlife; biology, wildlife management, geology, environmental sciences, local and state history, and related subjects. Principles and practices of basic accounting and record keeping. Park regulations and enforcement procedures, protocol, and appropriate corrective actions. Park maintenance practices and safe use of power tools. County and state laws, rules, regulations, and policies regarding operations. Basic recreational activities of the park user including boating, fishing, hiking, camping, mountain biking, horseback riding, nature study, etc. Basic principles of First Aid and CPR. First Responder level or higher desired. Make immediate, important, and critical decisions related to enforcement and emergency situations. Work in partnership with area managers, department staff, and other resource agencies to complete management objectives. Lift up to 50 lbs, kneel, carry (including a backpack and gear up to 25 lbs), push, stoop, squat, crawl, twist, grasp, walk, run, ride a mountain bike, and balance in the performance of assigned tasks. Walking or Mountain Biking may occur over long distances and uneven terrain. Establish and maintain effective working relationships with other County employees, representatives of other agencies and organizations, and members of the community. Operate personal computers including standard office applications. Complete light maintenance and use hand and power tools. Work a variety of weekends, weekdays, holidays, and evenings as assigned. Work outside in all weather conditions including temperature extremes. Six months experience in park, natural resources, law enforcement, or a directly related field desired. Some experience in customer service, public relations, general maintenance, boating and mountain biking desired. Equivalent to the completion of the twelfth grade required. Some college courses in Natural Resources Management, Park and Visitor Services Management, General Ecology and Biology, Wildlife Biology, or a related field desired. Possession of, or ability to obtain by starting date, a valid Colorado Driver's License. Possession of, or ability to obtain by starting date, a valid CPR and First Aid certifications. EMT or 1st Responder Certification is strongly desired. 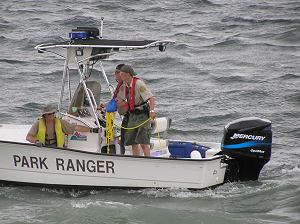 Exercises direct and indirect supervision over Ranger I staff, seasonal employees and volunteer staff as required. Contact violators and issue warnings or citations; check for appropriate permits; conduct investigations. Effect arrest, forcibly if necessary, using handcuffs and other restraints, subdue resisting suspects using maneuvers and weapons and resort to the use of hands and feet and other approved weapons in self defense. Conduct visual and audio surveillance for extended periods of time. Prepare investigative and other reports, sketches, and drawings, using appropriate grammar and symbols. Exercise independent judgment in determining when there is reasonable suspicion to detain, when probable cause exists to search and arrest, and when force may be used and to what degree. Gather information in criminal investigations by interviewing and obtaining the statement of victims, witnesses, suspects, and confidential informers. Perform and/or supervise rescue operations. 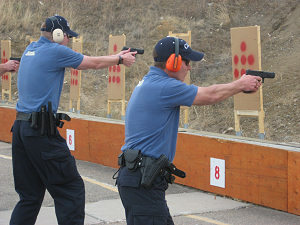 Load, unload, aim and fire handguns, shotguns, and other agency firearms under conditions of stress that justify the use of deadly force and at levels of proficiency prescribed in certification standards. 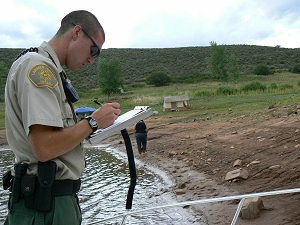 Perform searches of people, including juveniles, by giving information and directions, mediating disputes, and advising of rights and processes. Perform rescue functions at accidents, emergencies, and disasters to include directing traffic; administering emergency medical aid; lifting, dragging, and carrying people away from dangerous situations; and securing and evacuating people from particular areas. Endure verbal and mental abuse when confronted with the hostile views and opinions of suspects and other people encountered in antagonistic environments. Process and transport prisoners using handcuffs and other appropriate restraints. Read and comprehend legal and non-legal documents, including the preparation and processing of such documents as citations, affidavits, and warrants. Responsible for the development, implementation, and operation of a visitor program such as boating safety, trail use, interpretation, volunteers, entrance stations, revenue, etc. ; develop accompanying program procedures as appropriate. Provide information and directions to the public; investigate and resolve visitor complaints; ensure public safety and the enjoyment of park areas. Explain applicable rules and regulations to visitors for the purpose of protecting and preserving natural, historic, and cultural features, sites and structures. Perform regulation enforcement in an assigned park(s) by foot, by vehicle, ATV, mountain bike or other off road transportation and by boat. Issue warnings and citations to violators; conduct investigations of reported criminal and/or non-criminal offenses/incidents to collect evidence, statements, and other relevant information; may be required to provide testimony in court regarding investigations and/or citations. Comply with the policies and procedures of the Parks and Open Lands Department. Assist in the development of program policies and procedures as assigned. Respond to and perform effectively in emergency situations until relieved by appropriate agency or appropriate supervisor; respond to problem situations after normal scheduled hours as required. 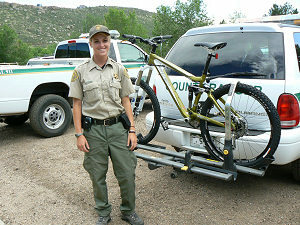 Prepare and maintain records and reports for the Parks and Open Lands Department. Assist in the development and implementation of volunteer programs and interpretive programs throughout the entire park system. Issue permits to other staff for purposes of sale to the public; account for collected monies incoming from the sale of permits; sell permits. Establish and maintain effective working relationships with those contacted in the course of work including other agencies. Provide lead accountability for other employees within work unit, which may include scheduling, assigning and reviewing work, instructing training in work methods, and providing input into hiring and performance evaluation process. Assist, train, plan and direct the work of, and supervise less experienced personnel. Obtain, arrange, and interpret data pertaining to specimens and historic objects and artifacts. Basic principles and procedures in law enforcement. A variety of major and minor provisions in criminal and civil law procedures. Colorado statutory law and constitutional law. A variety of techniques used in law enforcement in patrol, investigation, and crime prevention. Operation and care of firearms. First aid and cardiopulmonary resuscitation techniques. Principles and practices of effective natural resource management and environment conservation for the benefit of the user and for the protection of the resources and facilities. Recreational activities of the user, including boating, fishing, hiking, camping, mountain biking, horseback riding, nature study, etc. Wildlife, geology, environmental sciences, local and state history, and related subjects required for preparation and presentation of park interpretive programs. Record keeping and reporting procedures, including principles and practices of basic accounting and record keeping required to supervise and direct revenue collections and accounting at a county park. General principles of personnel supervision and training. Regulations and enforcement procedures, protocol, and appropriate corrective actions. County, Sheriff Office and state laws, rules, regulations and policies regarding park operations. Basic principles of First Aid and CPR to the First Responder level. Hazards associated with park operations work and safe work practices and precautions. Equivalent to a bachelor's degree from an accredited college or university with major coursework in Park Management, Wildlife Biology, Natural Resource Management or a related field. POST Certification Level One Peace Officer required within one year from hire date. POST Certification Level One Peace Officer preferred. Possession of, or ability to obtain, a valid Colorado Driver's License. Possession of valid First Responder and CPR certifications.